LATIN: "....divinitus revelatum dogma esse: Immaculatam Deiparam semper Virginem Mariam, expleto terrestris vitae cursu, fuisse corpore et anima ad caelestem gloriam assumptam." The Assumption never met the strong scholastic opposition found in the case of the Immaculate Conception. From Pius IX to Pius XII, the popes have spoken more often of Mary in heaven. They have at the same time received petitions and encouraged the movement for the dogmatic definition. 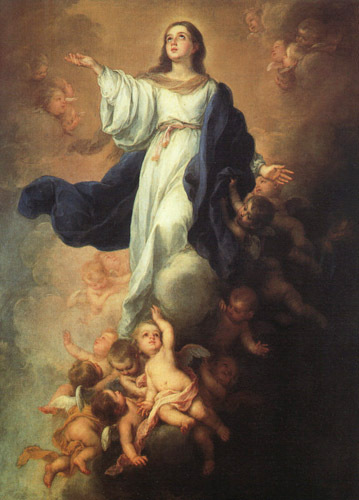 May we not then see in their references to Our Lady in heaven an implicit affirmation of her bodily Assumption? Pius IX (r. 1846-78), in Ineffabilis Deus, emphasized the close bond that linked the Mother of God with her Son Jesus Christ: "from all eternity joined in a hidden way with Jesus Christ in one and the same decree of predestination." Munificentissimus Deus connects the sinless conception and anticipated resurrection as parts of the same victory over sin and its consequences. Benedict XV, like his two predecessors, decreed that all the petitions for the Assumption be kept. During World War I he requested that the sending of petitions be deferred until peace came again. Pius XI encouraged the movement for the definition. On March 2, 1922, he named Our Lady under her title of the Assumption principal Patroness of France; and on May 31, 1937, gave his approval to the third-centenary celebrations of Louis XIII's solemn consecration of the kingdom to Our Lady, a vow that was annually commemorated on the feast of the Assumption. In the precise words of the definition are mentioned, in addition to the Assumption, only the three privileges of Our Lady defined as dogmas in earlier centuries: Mother of God, ever Virgin, Immaculate. Nothing is said of when or where or in what manner the Assumption occurred. Nor does the actual formula say anything about Mary's Mediation, her Queenship, or other privileges. In point of fact, both claims are justified. The early Church is silent on the destiny of Mary, in the sense that no extant document deals explicitly with that destiny until a half century after Nicaea. And if in the East we must wait until 377 before St. Epiphanius of Salamis offers his three hypotheses on the manner of Mary's departure from this world ("For either the holy Virgin died and was buried...or she was killed [martyred]...or she remained alive....")  the awakening of the West is a slower process still. Even when popular faith has been quickened, there is little evidence in the West of a theological movement to rival the homiletic productions of the East. If only because it is so surprisingly slender, the explicit witness of the West deserves to be detailed. Finally, however his silence may be explained, the fact remains that Jerome, who knew the local traditions of the Holy Land as well as Epiphanius, gives no indication that he is aware of any historical tradition with reference to the death of Our Lady, her grave, or an assumption. Briefly, between Nicaea (325 AD) and Ephesus (431 AD) the allusions to Mary's destiny are rare and insignificant. The first express witness in the West to a genuine assumption comes to us in an apocryphal Gospel, the Transitus beatae Mariae of Pseudo-Melito, which may stem from the middle of the sixth century. This account is significant, in the first instance, because it affirms unequivocally the death and burial of Mary, the reunion of her soul and body without delay, and her assumption into heaven in soul and body. It is significant, in the second place, for the developed Assumption theology which links this privilege causally with Mary's Maternity and virginity, and stresses the parallelism which ought to exist between Christ and His Mother in victory over death. The account of Pseudo-Melito, like the rest of the Transitus literature, is admittedly valueless as history, as an historical report of Mary's death and corporeal assumption; under that aspect the historian is justified in dismissing it with a critical distaste. But the account is priceless nonetheless -- historically and theologically. Historically, because it witnesses indisputably to the feeling of the faithful for Mary, a growing awareness of her dignity, even though we are unable to specify the full range of this awareness geographically or even to indicate its dawning. Theologically, because it postulates the Assumption on grounds that are valid not simply for piety but for scientific theology as well. Et super astrigeros erigis ora polos. Cingeris et niveis lactea virgo choris. Consulibus celsis celsior ipsa sedes. Ornata ex partu, mater opima, tuo." And raise your face above the star-bearing poles. And you are girt round with snowy choirs, O milk-white Virgin. You sit, yourself higher than the highest consuls. In the seventh century, only Isidore, Archbishop of Seville in Spain (d. 636), breaks the silence, but simply to attest our profound ignorance on the way Mary left this earth. Isidore echoes Ambrose: we have no evidence that Mary died a martyr. He echoes Epiphanius too: we have no information at all about her death. We learn from Isidore that the thesis of Mary's martydom still persists; we learn, too, of the Jerusalem tradition on her tomb -- a tradition which leaves him quite unmoved. We learn nothing about the Assumption. It will not be surprising to find in Spain, at the close of the eighth century, some Asturians directly denying Mary's Assumption -- the first to do so, as far as the evidence goes . It will [also] not be surprising to see develop in the ninth century, beside the tradition favorable to the Assumption represented by Pseudo-Augustine, another current of thought represented by Pseudo-Jerome and hostile, if not to the doctrine, at least to an unequivocal affirmation of the doctrine as somehow binding. For the silence of the first three centuries has been broken in the West only by unambiguous affirmations which have the disadvantage of being tagged as apocryphal, or by genuinely patristic affirmations which reveal a regrettable indifference, uncertainty, or ignorance. Not a few aspects of Marian theology with seeds in the early Christian West have inevitably been omitted from these pages. There is, for example, the complex, intriguing problem of the relationship between Mary and the Church; here it is Justin and Irenaeus and Tertullian, Ambrose and Augustine, who have had the initial significant insights. There is a lovely concept of Mary's Queenship, exercised not by jurisdiction but by intercession. There is the idea of Mary's universal Mediation, rooted in her function as Second Eve and suggested so vividly by Ambrose. There is much more, but perhaps enough has been said in this study to insinuate that the treasures of patristic Mariology are not the legitimate plaything of aprioristic speculation, nor will they reveal themselves in their totality to unaided historical analysis. The thought of the Fathers on Our Lady will be mined in its purity only by theologians with a feeling for philology, and by philologists deeply rooted in theology. the Greek homilies on the Dormition stemming from the seventh and eighth centuries. As the evidence stands, the first explicit reference to a genuine Assumption of Our Lady occurs in Epiphanius, ca. 377 AD. "But if some think us mistaken, let them search the Scriptures. They will not find Mary's death; they will not find whether she died or did not die; they will not find whether she was buried or was not buried. More than that: John journeyed to Asia, yet nowhere do we read that he took the holy Virgin with him. Rather, Scripture is absolutely silent [on the end of Mary] because of the extraordinary nature of the prodigy, in order not to shock the minds of men. "For my own part, I do not dare to speak, but I keep my own thoughts and I practice silence. For it may be that somewhere we have found hints that it is impossible to discover the death of the holy, blessed one. On the one hand, you see, Simeon says of her, 'And your own soul a sword shall pierce, that the thoughts of many hearts may be revealed' (Luke 2:35). On the other hand, when the Apocalypse of John says, 'And the dragon hastened against the woman who had brought forth the male child, and there were given to her an eagle's wings, and she was carried off into the wilderness, that the dragon might not seize her' (Rev 12:13-14), it may be that this is fulfilled in her. The testimony of Epiphanius is crucial for two reasons. Before Ephesus he alone deals expressly with the problem at issue; and he knows the Holy City and its traditions as few others of his time. It is the more regrettable, therefore, that his witness is so vague that several interpretations of his thought are possible. As a defensible exegesis I submit three points. How did Mary end her life? Epiphanius does not know. There are three possibilities: natural death, bloody martyrdom, deathless immortality. Of these, it is illegitimate to exclude any, illegitimate to impose any. In any event, the end of Mary's life on earth was worthy of God and in harmony with her dignity and holiness. In an unusual passage Gregory of Nyssa compares the Virgin with other virgins, to illustrate the victory of virginity over bodily death. Ordinary virgins destroy death's power by refusing to give it new victims. To sum up: Before Ephesus the scant evidence suggests strongly (a) that a widespread ignorance prevailed relative to Our Lady's destiny, and (b) that, save for isolated instances, Eastern Christianity had not yet confronted the problem. An intriguing corpus of literature on the final lot of Mary is formed by the apocryphal Transitus Mariae. The genesis of these accounts is shrouded in history's mist. They apparently originated before the close of the fifth century, perhaps in Egypt, perhaps in Syria, in consequence of the stimulus given Marian devotion by the definition of the divine Maternity at Ephesus. The period of proliferation is the sixth century. At least a score of Transitus accounts are extant, in Coptic, Greek, Latin, Syriac, Arabic, Ethiopic, and Armenian. Not all are prototypes, for many are simply variations on more ancient models. What do the Transitus Mariae stories say? In point of fact, the divergences are so pronounced that the accounts cannot be reduced to a genuine unity. some hostile Jewish intervention on the occasion of her burial. still others describe a genuine assumption, a reunion of soul and body which entails Our Lady's entrance into Heaven. The interval between death and prodigy varies from some moments to seven months. The locale is now the Mount of Olives, now the Valley of Josaphat, now Gethsemane. The earliest extant Byzantine discourse on the August 15th feast, the first monument of genuine Greek theology affirming the Assumption in categorical terms, is dated by Jugie at the end of the seventh century or the beginning of the eighth. Mary died (a) because her Son Himself willed to die, (b) because her nature is no different from our own, and (c) because her death was intended as confirmation of the reality of the Incarnation. She rose from the dead, was taken up to her Son, in the integrity of her human nature, because it was impossible for the vessel that had held God to be dissolved in dust. This, Germanus implies, is what the Christian sense imperiously demands. The bodily Assumption is a consequence of the divine Maternity. Another trilogy of sermons for the feast of the Dormition was delivered by John Damascene (of Damascus), very probably at Gethsemane on August 14th and 15th, about the year 740. Like Germanus, but with great discretion, he makes use of apocrypha, especially John of Thessalonica. With the candor of Andrew he confesses that the circumstances surrounding his account of Mary's end are conjecture or rhetoric. "For there was need that this dwelling meet for God, this undug well of remission's waters, this unploughed field of heaven's bread, this unwatered vineyard of immortality's wine, this olive-tree of the Father's compassion, ever green and fair and fruitful, be not imprisoned in the hollows of the earth. Rather, just as the holy and incorrupt body that had been born of her, the body that was united hypostatically to God the Word, rose from the tomb on the third day, so was there need that she too be snatched from the grave and the Mother restored to her Son; and, as He had descended to her, so she had to be carried up...to heaven itself. "There was need that she, who had entertained God the Word in the guest-chamber of her womb, be brought home to the dwelling of her Son; and, just as the Lord said that He must be in the place that belongs to His Father, so the Mother had to take up her abode in the palace of her Son, in the house of the Lord, in the courts of the house of our God. There was need that the body of her who in childbirth had preserved her virginity without stain, be preserved incorrupt even after death. There was need that she who had carried her Creator as a babe on her bosom, linger lovingly in the dwelling of her God. There was need that the bride whom the Father had betrothed to Himself, live in the bridal-chamber of heaven. "This is truly an amazing dogma, yet there is no Scriptural proof for it...."
And not "amazing" if one considers in Scripture that Enoch and Elijah were "assumed" to heaven, body and soul; and perhaps Moses if we interpret Jude's mention with the apocryphal literature (Assumption or Testament of Moses) as an "assumption" of the body of Moses. Jesus ascended to heaven on his own power, body and soul, and it is only fitting that His own Mother, the holy Mother of God, would also not see corruption. All true Christians will eventually be sinless and bodily assumed (resurrected and glorified) in heaven. The Blessed Virgin Mary, being a type of the Church as all the Fathers taught, is an example of the perfected Christian in heaven (cf. the holy, stainless, blameless Church mentioned in Ephesians 5:25-33; Heb 12:22ff; Rev 21:1ff). Mary received that perfected state (in soul and body) before the rest of Christ's Church by the grace of God. "Often there are theologians and preachers who, following in the footsteps of the holy Fathers, have been rather free in their use of events and expressions taken from Sacred Scripture to explain their belief in the Assumption. Thus, to mention only a few of the texts rather frequently cited in this fashion, some have employed the words of the psalmist: 'Arise, O Lord, into your resting place: you and the ark, which you have sanctified'; and have looked upon the Ark of the Covenant, built of incorruptible wood and placed in the Lord's temple, as a type of the most pure body of the Virgin Mary, preserved and exempt from all the corruption of the tomb and raised up to such glory in heaven. "Treating of this subject, they also describe her as the Queen entering triumphantly into the royal halls of heaven and sitting at the right hand of the divine Redeemer. Likewise they mention the Spouse of the Canticles 'that goes up by the desert, as a pillar of smoke of aromatical spices, of myrrh and frankincense' to be crowned. These are proposed as depicting that heavenly Queen and heavenly Spouse who has been lifted up to the courts of heaven with the divine Bridegroom. The Scriptures are the ultimate theological foundation for the dogma, according to Pius XII. "The patristic testimony is therefore non-existent on this subject. Even Catholic historians readily admit this fact..."
As a reminder for sola scriptura (Scripture alone) believers, the 27-book New Testament canon itself wasn't recognized by the Catholic Church until the late fourth century as well (first with St. Athanasius, 367 AD, then later Councils of Hippo/Carthage in 393/397/419 AD, and Popes Boniface I and Innocent I confirmed this same canon). On the Transitus literature: "There were many versions of this literature which developed over time and which were found throughout the East and West but they all originated from one source." They did not originate "from one source." Both Shoemaker (Ancient Traditions of the Virgin Mary's Dormition and Assumption) and Burghardt (Carol's Mariology articles above) tell us there are many strands of these Transitus traditions, and that the beliefs and traditions existed prior to the literature. Shoemaker in fact lays out several different types of these Transitus stories: the "Palm of the Tree of Life" traditions, the "Bethlehem" traditions, the Coptic traditions, "Atypical" traditions, "Late Apostle" traditions, traditions of Constantinople and Ephesus (Shoemaker, page 32ff). "Juniper Carol explicitly states that the Transitus literature is a complete fabrication which should be rejected by any serious historian." Juniper Carol does not state that. Fr. Burghardt, who wrote the articles on the western and eastern Fathers, does not use the words "complete fabrication" or even "fabrication." What he says is although they are "valueless" as strict history, they are nonetheless "significant," and "priceless" both historically and theologically. These Transitus accounts reveal a genuine Christian insight that it was not fitting that the body of Mary should see corruption. This argument is the same made on theological lines by the Fathers, Catholic theologians, and Pius XII in his definition of the Assumption. "....the Transitus literature is the real source of the teaching of the assumption of Mary and Catholic authorities admit this fact." Again, Fr. Burghardt does not say the "real source" of the Assumption is the Transitus. He says the "first express [written] witness in the West" to the Assumption is from the late fifth-century Transitus. In the East we have the statements in the fourth century from St. Epiphanius of Salamis that perhaps (he is unsure about the death or final lot of Mary): "her holy body from which light shone forth for all the world, dwells among those who enjoy the repose of the blessed" (Panarion 78:23, 377 AD; PG 42:737, translation by Fr. Luigi Gambero). Fr. Burghardt also implies Christians believed the doctrine prior to the literature. "....the Roman Church has embraced and is responsible for promoting teachings which originated, not with the faithful, but with heretical writings which were officially condemned by the early Church. History proves that when the Transitus teaching originated the Church regarded it as heresy....In the list of apocryphal writings which are to be rejected Gelasius signifies the following work: Liber qui apellatur Transitus, id est Assumptio Sanctae Mariae, Apocryphus....This specifically means the Transitus writing of the assumption of Mary....Pope Gelasius explicitly condemns the authors as well as their writings and the teachings which they promote and all who follow them. And significantly, this entire decree and its condemnation was reaffirmed by Pope Hormisdas in the sixth century around A.D. 520....These facts prove that the early Church viewed the assumption teaching, not as a legitimate expression of the pious belief of the faithful but as a heresy worthy of condemnation." This has already been refuted above. The objection confuses the Transitus "literature" with the Assumption teaching. The mistake is suggesting the Assumption itself was ever condemned, even if some of the Transitus literature was. A true belief can be contained in non-canonical or apocryphal material (e.g. the NT book of Jude quotes the apocryphal Book of Enoch). The doctrine of the Assumption was believed quite explicitly from the 6th and 7th century forward by noted saints and doctors of the Catholic Church, east and west: St. Gregory of Tours, St. John Damascene, St. Germanus of Constantinople, St. Andrew of Crete, Amadeus [bishop of Lausarme], St. Anthony of Padua, St. Albert the Great, St. Thomas Aquinas, St. Bonaventure, St. Bernardine of Siena, St. Robert Bellarmine, St. Francis of Sales, St. Alphonsus, St. Peter Canisius, etc. They weren't aware the belief was supposedly rejected by a Pope in the fifth century. According to Fr. Burghardt, the first Christians to dispute the Assumption were some "Asturians" from Spain in the eighth century, "the first to do so, as far as the evidence goes." (Carol Mariology, volume 1, page 153). And so on.... Also there is indeed one named "the book which is called the Assumption of holy Mary -- apocryphus"
Again, the Assumption itself is not condemned, only the book with that particular title is labeled "apocryphus." The doctrine of the Assumption is nowhere mentioned. The Gelasian decree has nothing to do with Mariology or the Assumption. It simply concerns the list of correct canonical vs. non-canonical writings received by the Church, with various heretics condemned at the end. That's it. There is no mention of this in Carol's Mariology as even relevant to the Assumption teaching, which it is not. If there was a writing that contained some apocryphal stories about Jesus, and that writing was titled "The Ascension of Jesus" -- we would not reject the Ascension because of this. As Catholic apologist Art Sippo notes: "The mere fact that a book supporting the Assumption is declared to be a pious fiction does not mean that the Assumption is itself denied. The Catholic Legion of Decency condemned the film 'King of Kings' in 1961 because of its Protestant biases. Did that mean that it condemned the story of Christ? No, just that particular telling of it." (from Patrick Madrid's Envoy Magazine discussion boards, Aug 2007). So the "Decree of Gelasius" might not be authored by Pope Gelasius. Shoemaker in his recent book on the Assumption traditions, agrees it is NOT Pope Gelasius (see his book, page 17, note 27) : "Although these theologians invest the decree with Papal authority, its author was not Pope Gelasius, but an otherwise unknown Christian of sixth-century Gaul." (he then notes Schneemelcher, New Testament Apocrypha, and Ernst von Dobschutz, Das Decretum Gelasianum, from 1912, also Jugie, La Mort, p. 167-171). "The only grounds the Catholic faithful have for believing in the teaching of the assumption is that a supposedly 'infallible' Church declares it." False. The grounds are both biblical and theological (see above). The Catholic Church, through the Papacy of Pius XII, only put its final and infallible "stamp of approval" after centuries of Marian development and theological reflection by the Fathers, Doctors, Popes, and Catholic faithful who already believed the doctrine for over a thousand years. The Orthodox, who split with Catholics in the 11th century, also clearly affirm the dogma. The theological argument from Pius XII: "She, by an entirely unique privilege, completely overcame sin by her Immaculate Conception, and as a result she was not subject to the law of remaining in the corruption of the grave, and she did not have to wait until the end of time for the redemption of her body." The Assumption follows from the complete sinlessness (Immaculate Conception) of the Mother of God. The Greek Fathers believed the Assumption based on Mary as Theotokos, her perpetual virginity, and her all-holiness (Panagia or All-Holy One). Burghardt: "...the solution is given [i.e. in the Transitus], incorruption is postulated, on theological lines: the principles of solution are the divine Maternity, Mary's unimpaired virginity, her unrivaled holiness..." and "...a genuine Assumption, preceded by a glorious resurrection and postulated by the divine Maternity, is reiterated again and again [in Modestus of Jerusalem]..."
and the Assumption is completely in harmony with other revealed truths of the Catholic Faith. AAS (Acta apostolicae sedis [Vatican City, 1909- ]), Vol 45, 1953, p. 568.  ibid, p. 583.  ibid, Vol 42, 1950, p. 769. English of the NCWC trans, No. 44, also Palmer, p. 113. AAS, Vol 42, 1950, p. 756, NCWC trans No. 12, cf. Bishop Wright, "The Dogma of the Assumption" in The American Eccl Review, Vol 124, 1951, p. 81-96. D.E., 530. AAS, Vol 42, 1950, p. 757; NCWC, No. 13.  ibid, p. 758.  ibid, p. 758.  ibid, p. 760. This prayer now occurs as a Collect in the Assumption Mass of the Dominican, Carmelite, and other rites. AAS, Vol 42, 1950, p. 760. G. Geenen, OP, L'Assumption et les Souverains Pontifes... in Angelicum, Vol 17, 1950, p. 327-355. Fr. Geenen has gathered his facts from M. Jugie, AA, La Mort et l'Assomption de la Sainte Vierge (1944). William O'Shea, SS, "The History of the Feast of the Assumption," in The Thomist, Vol 14, 1951, p. 127-128.  quoted in Munificentissimus Deus, AAS, Vol 42, 1950, p. 768. AAS, Vol 42, 1950, p. 754. On the relationship between the IC and the Assumption, cf. Roschini, "The Assumption and the Immaculate Conception," in The Thomist, Vol 14, 1951, p. 59-71; and K. Healy, O.Carm., "The Assumption among Mary's Privileges," ibid, p. 77-81. Geenen, p. 337-338; Healy, p. 78. AAS, Vol 42, 1950, p. 755. Tondini, 158; Lawler, 116 (The Rosary of Mary, ed. Wm. Lawler, OP (1944). Geenen, p. 339. Unger, Mary Mediatrix, p. 16-17. AAS, Vol 35, 1943, p. 247-248. There is also a connection between the doctrine of the Immaculate Heart, to which the Pope here refers, and the bodily Assumption, for Our Lady's Most Pure Heart is her physical heart. Cf. Remigius De Roo, Regina in Coelum Assumpta, in Les Tracts Marials, Nos. 37-38, 1953. AAS, Vol 42, 1950, p. 756.  ibid, p. 782-783.  ibid, p. 756.  ibid, p. 769.  ibid, p. 754, 758.  ibid, p. 763.  ibid, p. 769-770. M. Jugie, La mort et l'Assomption de la sainte Vierge (1944). G. Jouassard, L'Assumption corporelle de la sainte Vierge et la patristique in Assomption de Marie (Paris, 1949), p. 102. O. Faller, De priorum saeculorum silentio circa Assumptionem b. Mariae Virginis (Rome, 1946), p. 129. Epiphanius, Panarion, haer. 78, cap. 23. Cf. Jugie, p. 77-81; Faller, p. 33-43; Altaner in Theologische Revue, Vol 44, 1948, p. 131-133. Tychonius view is transmitted by Cassiodorus, Complexiones in Apocalypsin, n. 16, PL 70:1411. Ambrose, Exposit evang secun Lucam, lib 2, n. 61. Ambrose, De instit virg, cap 7, n. 49; PL 16:333. Ambrose, De interpell lob et David, lib I, cap 7, n. 25. Paulinus, Epist 50, n. 17-18. Same in Augustine, Epist 121. Augustine, Epist 149, n. 33. Augustine, In evang Ioannis, tr 8, n. 9, PL 35:1456; De catechiz rudibus, cap 22, n. 40, PL 40:339; Enarratio in ps 34, Serm 2, n. 3, PL 36:335. Altaner, Theologische Revue, Vol 44, 1948, p. 133-134. The Transitus Mariae literature attempts to fill up the lacunae of the canonical books on the life, death, and final lot of Mary. Perhaps the oldest is a fifth-century Syriac Transitus, which made its way into the West, probably in a Latin translation, and caused such scandal that it was listed in the books proscribed by the Decretum Gelasianum (so-called Decree of Pope Gelasius) at the beginning of the sixth century. cf. A. Thiel, Epistolae Romanorum Pontificum genuinae, Vol 1, 1868, p. 465; A.C. Rush, "Assumption Theology in the Transitus Mariae," in The American Eccl Review, Vol 123, 1950, p. 93-110, esp 101. Jugie would date it about 550, while Faller argues for the fourth century AD. For the text, see Tischendorff, Apocalypses apocryphae (Leipzig, 1866), p. 124-136, English trans by M.R. James, The Apocryphal NT (Oxford, 1924), p. 209-216. Pseudo-Melito, Transitus beatae Mariae, cap 15, n. 2ff; Tischendorf, p. 134ff. Gregory of Tours, Lib 1 miraculorum: In gloria martyrum, cap 4, PL 71:708; on the date, W.C. McDermott, Gregory of Tours: Selections (1949), p. 9; on fifth-century Syriac Transitus, which Jugie regards as oldest, cf. W. Wright, Contrib to Apoc Lit of NT (1865), p. 46f; Jugie and Altaner believe it likely Gregory borrowed from an early Latin translation. Gregory, cap. 9; PL 71:713. Jouassard, L'Assomption corporelle, p. 111-112. (translated by Edwin [Contarini], Envoy Magazine boards), the lines are found in Miscellanea, lib 3, cap 7, PL 88:282; the poem belongs before 576, there is some doubt as to authorship, but H. Weisweiler, in Scholastik, Vol 28, 1953, p. 520. Isidore, De ortu et obitu patrum, cap 67, n. 112, PL 83:148-49. Later redaction presents the existence of the Jerusalem tomb as certain, PL 83:1285-1286. Adamnan, De locis sacris, lib 1, cap 12. Bede, Liber de locis sanetis, cap 2 & 5. Bede, Liber retractationis in Actus apostol, cap 8, PL 92:1014-1015. Jugie, p. 272-274.  correspondence between Bishop Ascarius and his friend, Tuscaredus, PL 99:1233-1235. The Asturians believed Mary died like anyone else, but her body was still in the tomb awaiting resurrection; the thesis scandalized Ascarius; Tuscaredus replied that we have no evidence of a violent death, or any death. It would seem Tuscaredus believed in Mary's glorious immortality. Pseudo-Jerome, Epist 9, Ad Paulam et Eustoch de assump BMV, n. 2, PL 30:127-128; Pseudo-Augustine, De assump BMV, n. 2-9, PL 40:1143-1148; on authorship cf. Jugie, p. 278, 290-291. Faller, p. 69-76. F. Cayre, L'Assomption aux quatre premiers... in Studia Mariana, Vol 4 (1948), p. 135ff. C.F. De Vine, "The Fathers of the Church and the Assumption," in Vers le dogma de l'Assomption, p. 408-410. Faller has developed these and other principles at length, p. 77-128. Jouassard, L'Assomption corporelle, p. 115-116; W.J. Burghardt, "The Catholic Concept of Tradition in the Light of Modern Theological Thought," in Proceedings of the Sixth Annual Convention (Catholic Theological Society of America, 1951), p. 73-75. A. Muller, Ecclesia-Maria: Die Einheit Marias und der Kirche (1951); G. Montague, "The Concept of Mary and the Church in the Fathers," in The American Eccl Review, Vol 123, 1950, p. 331-337; K. Dalahaye, Maria, Typus der Kirche, in Wissen & Weis Vol 12, 1949, p. 79-92. H. Barre, La royaute de Maria pendant les neuf premiers siecles, in Recherches de science religieuse, Vol 29, 1939, p. 129-162, 303-334; A. Luis, La realeza Patristic Period, in Marian Studies, Vol 4, 1953, p. 82-108.  the articles of Bover in a previous note. Jugie, p. 95-146; Jouassard, Marie a travers la patristique, p. 139-147. Andrew of Crete, Oratio 4: In nativ b. Mariae, PG 97:872. The authenticity of the passage is suspect. Epiphanius, Panarion haer 78, n. 10-11;  ibid, n. 23.  see same solution of M. Jugie, Le mort et l'Assomption de la sainte Vierge (1944), p. 77-81; a more benign interpretation is offered by O. Faller, De priorum saeculorum silentio circa Assumptionem b. Mariae virginis (1946), p. 33-43. F. Cayre, L'Assomption aux quatre premiers... in Studia Mariana, Vol 4 (1948), p. 144-145. Ephraem, De nativitate domini sermo 12, 11, 4; Opera omnia syriace et latine, Vol 2, p. 415. Ephraem, Sermo 1 de diversis; Opera omnia, Vol 3, p. 600; Jugie finds this sentence an early patristic idea which located the temporary abode of just souls in an earthly paradise, cf. La mort, p. 60. Ephraem, Hymni de beata Maria, 15, n. 2. Ephraem, Sedra de probis et iustis. Gregory of Nyssa, De virginitate, cap 14 (13); Cavarnos, p. 306. Jugie, La mort, p. 63. Severian of Gabala, In mundi creationem oratio 6, n. 10, PG 56:498. Jugie, La mort, p. 64-65.  ibid, p. 73-74;  In prophetam Simeonem, ed. Faller, p. 26, PG 86:245. For two well-reasoned interpretations: Jugie, La mort, p. 74-76; and Faller, p. 30-31. B. Capelle, Les homelies liturgiques du pretendu Timothee de Jerusalem, in Ephemerides Liturgicae, Vol 63, 1949, p. 5-26; Jugie considers Timothy a contemporary of Epiphanius. Jugie, La mort, p. 101-171; A.C. Rush, "The Assumption in the Apocrypha," in The American Eccl Review, Vol 116, 1947, p. 5-31; "Assumption Theology in the Transitus Mariae," ibid, Vol 123, 1950, p. 93-110. Obsequies of the Holy Virgin, W. Wright, Contrib to Apoc Lit of NT (1865), p. 46f; on dates, Jugie, La mort, p. 107-109. Another pertinent but controverted document is in John Damascene's Hom 2 in dormit Mariae where an unknown author has Juvenal, Archbishop of Jerusalem, narrate at the time of Chalcedon what he has learned about Mary's passing "from an ancient and utterly unerring tradition." This embraces her death, the arrival of the Apostles, the vision of angels, the commitment of Mary's soul to God's hands, the burial in Gethsemane, the discovery after three days of a coffin empty save for burial shrouds, the Apostles' conclusion that Christ wanted to honor His Mother's immaculate body "with incorruption and transposition before the common, universal resurrection." The Historia of which this is an exract has not been recovered. Many scholars consider the extract an interpolation in Damascene's homily. Euthymiaca historia, lib 3, cap 40, in John Damascene's Hom 2 in dormit Mariae, n. 18, PG 96:748-752; Jugie calls the Juvenal narration sheer legend and insists it should not be dated much before 890, cf. La mort, p. 160-167; while Gordillo follows Kekelidze, Abel, Baldi in admitting its historicity, pointing to the temperate narrative and its similarity to Epiphanius' approach, cf. Mariologia orientalis (Rome, 1954), p. 222, note 45. Altaner: "...no tradition underlies the Transitus which is to be taken seriously from a historical point of view...", col 135. The influence of the apocrypha is evident in a pastoral letter, The Dormition of Our Lady (c. 620) in which John, Archbishop of Thessalonica, introduced the Dormition feast into his diocese shortly after Emperor Maurice prescribed it for the Empire; cf. Jugie, Patrologia Orientalis, Vol 19, 1926, p. 344-438. Rest of long footnote omitted. According to Jugie, the first traces of a special solemnity that makes express mention of Mary's death and Assumption do not go back beyond the second half of the sixth century. In many churches, however, this feast of the Dormition was an outgrowth of the primitive Marian feast, the Commemoration of the Blessed Mary, which celebrated in general fashion Mary's entry into the Church Triumphant. Rest of long footnote omitted. Encomium in dormitionem sanct dominae nostrae semp virginis Mariae, PG 86:3277-3312; on authorship, Jugie, La mort, p. 215-218; L. Carli, 1940, p. 387. Encomium, n. 11, PG 86:3308;  ibid, n. 12.  ibid, n. 7, PG 86:3293.  ibid, n. 14, PG 86:3312; cf. Jugie, La mort, p. 222.  ibid, n. 5-6, PG 86:3289, 3292-3293. Jugie, La mort, p. 223. The three homilies in PG 98:340-372 are actually but two, the first two are two parts of one homily. Germanus, Hom 3 in dormit, PG 98:368. Germanus, Hom 1 in dormit, PG 98:348. Andrew of Crete, Hom 2 in dormit, PG 97:1072; order of first two homilies are reversed. ibid, Hom 1, PG 97:1080-1; Rest of footnote omitted. John Damascene, Hom 3 in dormit Mariae, n. 2-3, PG 96:753-757.  ibid, Hom 1, n. 2, PG 96:725.  ibid, Hom 2, n. 14, PG 96:740-741.  ibid, Hom 2, n. 2, PG 96:724.  ibid, Hom 2, n. 4, PG 96:729. Mention should be made of Cosmas Vestitor, an orator of moderate ability, who apparently lived in Constantinople c. 750 AD, whose four discourses on the Dormition reveal an Assumption theology remarkably sound. Rest of footnote omitted. R.L.P. Milburn, Early Christian Interpretations of History (1952) devotes an Appendix and part of a chapter on the historical background of the Assumption, p. 134-141, 161-192. There is "no means of disproving the doctrine of the Assumption, for, in the absence of historical data, it is not given to mankind lightly to confine the power of a God 'whose judgments are unsearchable and whose ways are past finding out...' " (p. 139). He is less than fair as an historian, however, to Modestus, Germanus, Andrew, and Damascene when he does not reveal that their primary reasons for asserting an Assumption of Mary are not pseudo-historical but theological. Rest of long footnote omitted. see the splendid brief survey of the patristic period by G. Jouassard, L'Assomption corporelle de la sainte Vierge et la patristique, in Assomption de Maria (Paris, 1949), p. 99-117.